Noise, or unwanted sound, can be an annoyance or, when it is excessive or prolonged, can disturb concentration, make speech difficult to hear or even damage hearing. Personal health, safety and productivity can be harmed as a result. As such, the control of background noise affects everybody. As reverberations (or echoes) when the sources of the sound are in the same space (we will discuss acoustic absorption or correction measures). 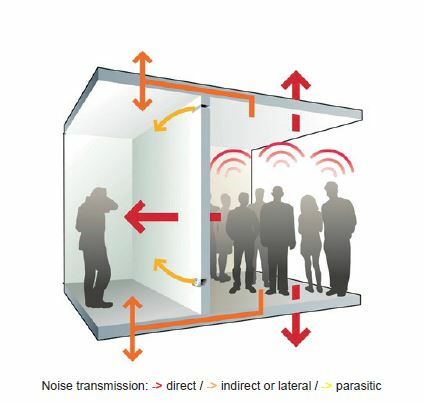 As airborne noise or impacts when the sounds are produced in adjacent spaces (we will discuss sound insulation or noise reduction). Sound absorption involves the damping (or absorption/correction) of reverberating sound in the same space as the source of the sound. The usual method involves covering all or part of the space with a material that absorbs sound. Sound waves’ energy is partially deflected and partially absorbed when it encounters an object. The effectiveness with which a material absorbs sound is measured using its sound absorption coefficient, defined as the ratio of the sound energy absorbed to the total available sound energy on the surface. For example, a material that absorbs 75% of sound energy at a particular frequency that meets its surface, has a sound absorption coefficient s of 0.75 for this frequency. The sound absorption coefficient will vary by frequency. 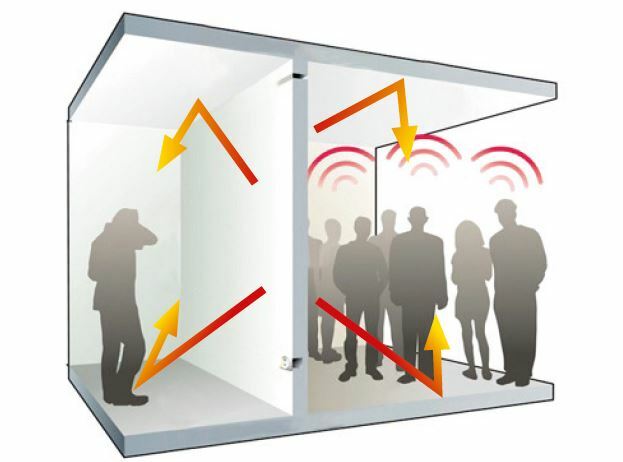 The noise reduction coefficient (NRC) is the average of the sound absorption coefficients measured in the frequency range between 250 and 2000 Hertz. The weighted acoustic absorption coefficient w also takes into account the perception of the human ear, and is supplemented by a shape index that indicates when the product is especially effective in absorbing low (index L), mid (index M) or high (index H) frequencies. Increasing sound absorption in a space does not result in a corresponding increase in acoustic reduction between spaces, although it does help. There is no direct relationship between correction and reduction. It is therefore necessary to directly assess this property. The measurement of a wall’s acoustic reduction of airborne noises is carried out according to standard NF EN ISO 140-3, noting, for each frequency, the difference in intensity between the sound produced and the sound measured on the other side of the wall. This produces a curve representing the reduction R depending on the frequency. This curve is used to determine the single weighted index Rw (C; Ctr) in dB. Reduction of ground transport infrastructure noise: RA.tr = Rw + Ctr in dB.